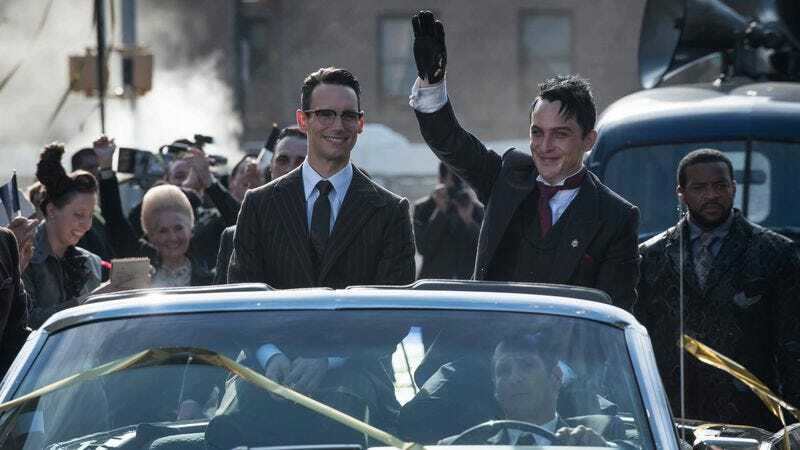 "Mad City: Anything For You"
“Anything For You” opens with a montage of Cobblepot doing some community outreach in the city, clearly enjoying his new position as Mayor. There’s only one problem: he needs “someone to share it with.” He’s essentially in a rom-com, because he can’t see what’s right in front of him. Speaking of which, I’m not the writer to handle this, but I’d love to read an examination of the queer subtext of Gotham, with a particular focus on the villains. Both the Nygma-Cobblepot and Barbara-Tabitha relationships are filled with material to dig into. In fact, I’m so far down the queer subtext rabbit hole that I thought, for just a moment, Cobblepot and Nygma were going to kiss at the end of the episode. Alas, they settled for a hug, and now we’re stuck with the boring romance brewing between Selina and Bruce. Allegiances are a little messy throughout the episode. Nygma’s plan to overthrow Butch, who’s recently taken up arms with his own version of the Red Hood Gang, is pretty convoluted. It’s too much for an episode that has a lot of other subplots swirling around. I mentioned it last week, but it bears repeating: Barbara is a great character now. Laughing at villains getting punched in the face and swirling martinis while forming a badass team with Tabitha on the side? I’m all in. So we got our first glimpse of “new” Ivy this week. Not much to say because she doesn’t get to do much, but it’s looking like it’s going to be a rocky subplot. 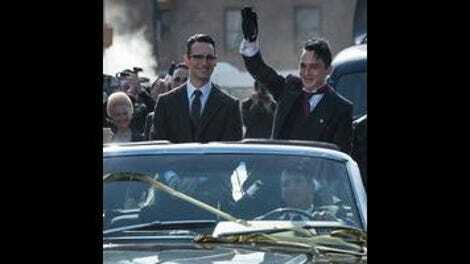 Did anyone else pump their fist when Thompkins slugged Nygma? Just me? Nobody else interacts with TV shows that way? Let’s move on then. I like the idea of Gotham setting up a struggle between Cobblepot and Nygma, and the newly-formed team of Tabitha, Butch, and Barbara. Gives the show a little more plot to play with, taking some of the dramatic responsibility away from anything involving Jim Gordon. Past seasons have focused too much on Gordon’s barely-defined struggles, so this new setup is promising. Speaking of Jim’s boring adventures, I couldn’t care less about his budding relationship with Valerie Vale. There’s nothing interesting there yet, and the show seems to be taking its time establishing some sort of stakes for Jim Gordon. Bullock respects the sanctity of happy hour. Therefore, I have great respect for Bullock. We all knew it was coming, but it’s official now: Alice’s blood has started to transform Barnes into something super strong. Here’s hoping the show doesn’t tease out the “truth” about him for too long.